Do you want to make a difference in your healthcare organisation? Looking for new solutions to everyday challenges? 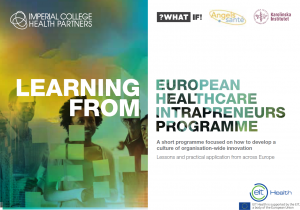 In November we are holding the Learning from European Healthcare Intrapreneurs Programme, supporting executive and front line staff to become “intrapreneurs” who are able to tackle real challenges in their healthcare organisations, by teaching them how to scout for, adopt and scale innovation in their every day roles. The Learning from European Healthcare Intrapreneurs programme, held in Paris from 6-8 November and also supplemented by some home working, draws on the best learning from healthcare systems from across Europe. Its purpose is to support participants is to develop their capability and capability to adopt innovation, to address healthcare challenges in their organisations. The programme will also have a strong focus on supporting participants to learn how to scout for existing best practice, and adapt solutions to their environment. During the programme they will also hear from examples of best practice from across Europe. Read more details about the programme here. We have been running the UK version of this programme in partnership with thought leaders ?WhatIf! Innovation for over three years now, and feedback has been enormously positive, with 100% of our 2017 attendees saying they would recommend the course to a colleague. The cost is 1950 euros per person for non-ICHP members, but ICHP member organisations will be subsidised to attend. How do I find out more and/or apply? Read more about the programme on our website. The deadline for applications is midday on Friday 5 October, and all applications will be informed whether they are successful on Monday 15 October.